The Monteverde School was founded in 1993 with a belief in the importance of these early years and a commitment to creating the kind of environment which nurtures the natural curiosity and enthusiasm for learning so inherent in the preschool child. We are influenced by many great minds and teachers who have come before us as well as by our own values and experiences with children over the past twenty years. What follows are some very brief highlights of these philosophies which guide our daily practice. For more in depth information please schedule a tour. Before we even opened our doors we were intrigued by this amazing group of early childhood schools in the Italian town of Reggio Emilia. They were chosen as the best preschools in the world by Newsweek in 1991 and educators in the United States were just beginning to learn about their practices. From our first conference in 1992 we felt a strong connection to their practices and values which we continue to deepen every year. We are committed to creating an environment where each child is accepted as an unique, intelligent, curious being who is competent and gifted in their own way. Every child... heard. They have a right to be completely loved for who they are. Every child has the right to imagine, to feel, to grow, to discover, to make mistakes and to be heard. That is our image of every child. We believe that learning takes place in interrelationships. 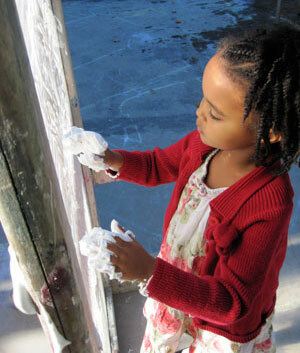 We plan our environment to allow for, and even encourage, movement, interdependence and interaction. All our teachers work together as a team, offering their different talents, insights, identities, and skills to make the whole experience of each child richer. 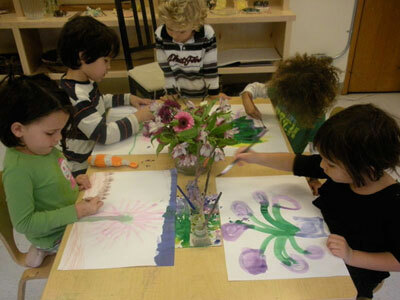 Teachers and children collaborate together to create projects which follow the children's explorations and questions. It is more than mere cooperation, it is a meeting of minds which creates a more meaningful experience for all concerned. Without language we can't make meaning of the world. Without meaning, we can't make language. They go hand in hand. At Monteverde the children, teachers, and parents go on a journey of discovery together. 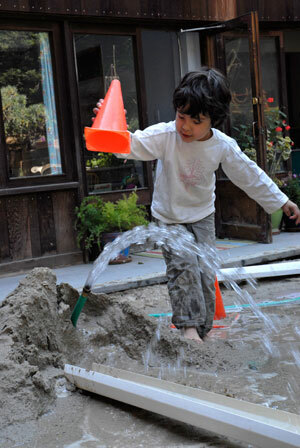 To make sense of what they discover and to explore their wonder, children need many means of expression. It is not enough to talk one-on-one, or to have discussions as a group (though we do both those things often). Speech may be insufficient to express all the feelings, thoughts, and insights the children wish to convey. We encourage children to express their learning and discovery in as many "languages" as possible. These "languages" include a lot of drawing, painting, collage, work in clay, construction with wood and recycled materials, wire sculpture, and also shadow play, imaginary play, dance, tumbling, and running. "Childhood is, or has been, or ought to be, the great original adventure." says Michael Chabon in his article The Wilderness of Childhood. There is something very important about connecting to nature in childhood. There is even a name for the modern phenomenon of not having nature as a regular part of our lives: nature-deficit disorder. "Diminished use of the senses, attention difficulties and higher rates of emotional and physical illnesses." (Louv, 2005) were found to particularly affect children. Our children are part of the gardening process from the beginning of just digging in the soil, adding worms, planting seeds, watering, adding ladybugs, and harvesting. We are also lucky enough to have a wilderness area where the children feel empowered to go on many wanderings and adventures. There is something about being under the trees, digging in dirt and gathering foliage that expands their imaginary and social worlds. 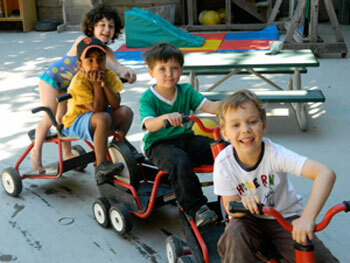 During the preschool years children take a gigantic leap in their social abilities. They come in as 2 year olds who are still engaged in parallel play. It is in this setting that they learn what a friend is and how to be a friend. They begin by engaging one-on-one and, by the time they leave, they are able to negotiate working and playing in groups. The following concepts help us to guide them through this complicated process. Vivian Paley introduced these 6 words to her kindergarten classroom in Chicago over a decade ago and then wrote a book about the experience with this title. She says: "Free acceptance in play, partnerships, and teams is what matters most to any child." This is a rule all Monteverde children know and are able to help negotiate. It doesn't mean they never try to exclude, that is a developmentally appropriate attempt to try out your power. However, when reminded of the rule by a teacher or a peer the question quickly turns to "How can this person play with you?" The result of teaching this practice, according to Maya (age 5), is that "At Monteverde it's all love and everybody shares the world." This is a thoughtful approach to having a positive attitude to all diversity. Preschool age children are naturally curious and will ask questions about similarities and differences between people that they observe, just as they would ask questions about nature. Teachers treat their comments and questions seriously and respectfully. We evaluate our books and other materials to be sure that they are inclusive. We plan art projects which ask children to look at themselves and others such as self-portraits and drawing portraits of friends. We do not celebrate traditional holidays, thereby avoiding both bias or a "tourist curriculum". We do invite all our families to come share traditions, recipes, stories and themselves. There has been an unfortunate trend in education in the last 20 years to "push down the curriculum". There became an equation that earlier was better. This is a developmentally inappropriate concept. Just as a baby needs to crawl and pull themselves up to standing before they can learn to walk there are important skills that a preschooler needs to learn before they are ready to read. Reading experts have determined that six specific early literacy skills become the building blocks for later reading and writing. Research indicates that children who enter school with more of these skills are better able to benefit from the reading instruction they receive when they arrive at school. These skills are: a large vocabulary, print motivation (an interest in and enjoyment of books), print awareness (i.e. knowing that a word on a page represents a specific word that you say), narrative skills, letter knowledge and phonological awareness. Monteverde students leave with all six of these skills because they are part of a daily literacy rich environment that includes a multitude of books, poems, rhymes, chants, songs, plays, sign-making, recipe reading, labels, opportunities for dictation and encouragement to do their own writing at whatever stage is appropriate for them. 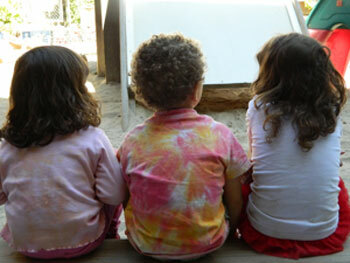 Though storytelling doesn't involve the written word it is an integral part of the Monteverde pre-literacy curriculum. Stories are told at gathering times like circle, before nap or at transitions. Stories are also told spontaneously and upon request. 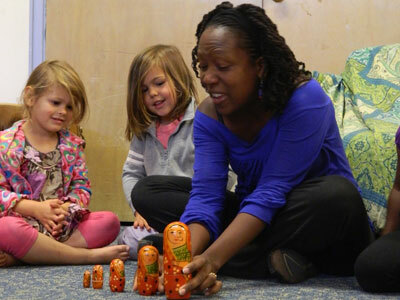 Using traditional tales, silly stories, and personal remembrances the teachers share the gift of story and encourage and invite the children to tell their own. 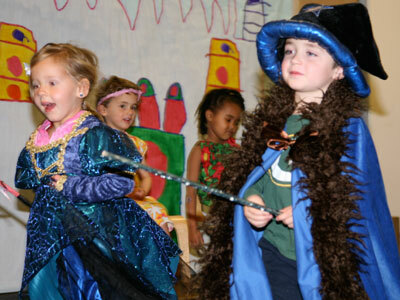 Children explore stories in varied mediums such as acting, using puppets, drawing and telling as a teacher dictates. Through storytelling children and adults create a safe space to experience powerful emotions and gain a sense of belonging to a group. When listening to a story a child creates their own image in their mind which is becoming a lost skill in our society of visual inundation and is critical to abstract thought. They learn to communicate more effectively by building their speaking and listening skills. They develop a rich vocabulary, an understanding of sequence and a love of story which are all essential building blocks for literacy.